As a new mom, I've found that having the right baby gear that makes my life easier is pertinent to my survival. We received so many gifts at my surprise baby shower, but it's not until baby is actually here that you realized what you need and what you don't. I've rounded up my absolute favorite items thus far. Whlie I could make a list that goes on and on, these are really the key items that I use all the time and really do make life easier for Sweet P and me (and Shaun too!). As time goes on and Penelope changes, I'll continuously update what we're using and loving (and maybe what we've found we don't need too). aden + anais swaddle blankets: I am obsessed with these. Nice and lightweight, these are perfectly large for swaddling, as a stroller blanket, or even to put down over the diaper mat for extra comfort for P. Oh and it doesn't hurt that they are dern cute too. boppy pillow: I couldn't live without this for nursing. It came to the hospital with us and never left my side since. It's also great for propping her up during smiley playtime in the mornings now that she is bigger. Oh and I also recommend an extra slipcover! dr. brown's all-in-one gift set: This has everything you will need for bottle feeding, including plenty of bottles, brushes, steam baggies, pacifiers and more. Seriously. Get it. I didn't need anything outside of this for bottle feeding, and I was totally confused by what I'd need before baby arrived. This was a life-saver! fisher-price rock 'n play: We opted to use this in lieu of a bassinet and Penelope slept like a rock in it every night for 3 months. It takes up minimal space and is incredibly portable for weekend getaways or napping at the grandparents' houses. aveeno baby soothing relief moisture cream: Penelope had/has incredibly dry skin and this is the only lotion I've found to get the job done. She would scratch at her snake-skin chest any chance she could get. After a few days of liberal application, her skin is soft as a baby's bottom and no more scratching. eric carle chime set: My mom bought these for Penelope and hanged them from her car seat bar. As soon as she could see them, Pen would simply sit and smile at them, melting my heart in the process. She especially loves the elephant. gerber short sleeve bodysuits: I always put one of these on Penelope under her outfits or sleepers to keep her warm. They are super lightweight and if it's warm, she can just hang out in one of these. I love having lots on hand as they dirty very quickly. chicco cortina keyfit travel system: An amazing car seat and stroller combo. It's lightweight yet durable and so easy to use (my favorite part). No sweating, pulling, lugging or getting stuck. The car seat clips right into a base in the car and then fits right into the stroller. Once she outgrows this car seat, the stroller can also just be used as a regular stroller. It's genius, I tell ya. Oh and I absolutely adore the gorgeous blue Azura color. 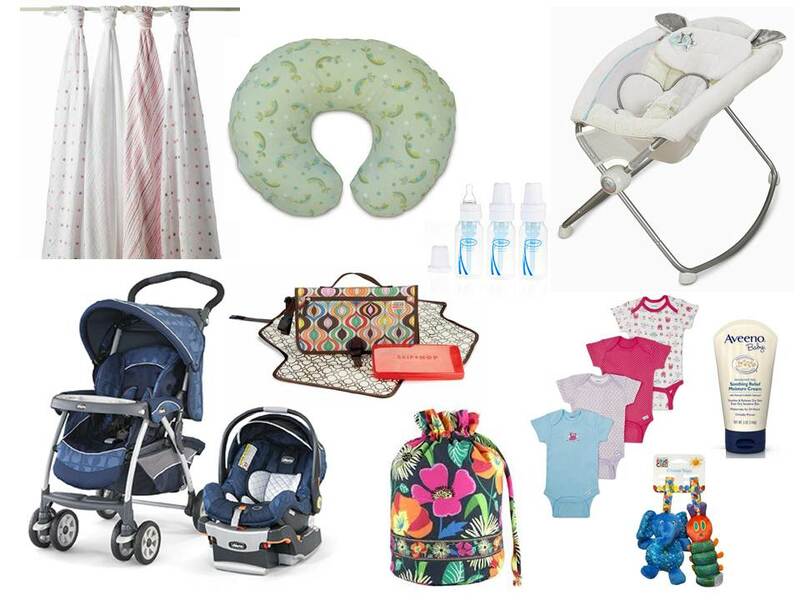 So those are the products we're loving for baby these days. What are your go-to baby products? What products surprised you in what you loved or didn't love? I never thought a diaper changing mat would get me all giddy! p.s. : these are products that I really use and love. No perks or product placement here, just sharing what works for our family!